Here you will find a number of headsets designed for use with Speech Recognition Software such as Dragon Professional Individual V15. These headsets offer high levels of accuracy as well as comfort and flexible wearing styles. 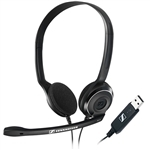 Professional wired USB headset featuring high quality voice clarity... Double-sided headband headset featuring noise cancelling capabilities... The Nuance Dragon Bluetooth Wireless Headset designed for hands-free communication with your mobile device, laptop, computer or tablet.